Fishing cat (Prionailurus viverrinus) complete detail. 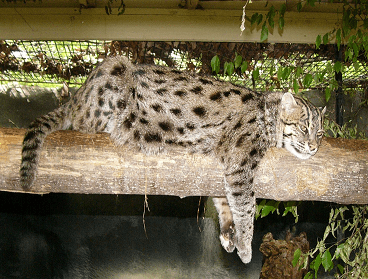 Description of Fishing cat – Prionailurus viverrinus. Classification of Fishing cat. Habit and habitat of Fishing cat. They prefer dense forested regions, and wetland areas. They also found in scrub areas, reed beds, tidal creek areas, vegetated areas near water, marshes, mangroves, rivers, and streams. 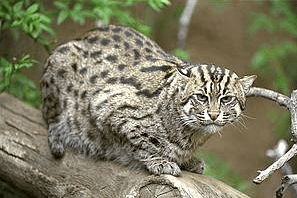 Fishing cat is a nocturnal and solitary animal that rests amongst dense vegetation during the day before heading to the water at night to find food……………. The underside fur is longer and often overlaid with spots. Dark strips are present around the throat. They have short tail (around one-third the length of their body). Black incomplete rings are present on the tail. Legs are strong and short, with the forelimbs having two distinct elbow bars. The paws are webbed, and the claws extend past the claw sheaths when retracted. Both sexes are similar in appearance, but males are slightly larger than females……………. Breeding season is between January to April. The age of sexual maturity is between 9 to 18 months. The gestation period is between 63 to 70 days. Females give birth to 2 or 3 kittens. Their eyes are open by 16 days. They are able to actively move around by the age of one month. Meat is taken around about two months of age. The kittens are weaned between four and six months. They reach full adult size at about 8 to 9 months old. Young are fully independent………….. Fishing cat is a Schedule – I animal, according to wildlife (Protection) act, 1972 and classified as Endangered (EN) by the IUCN. 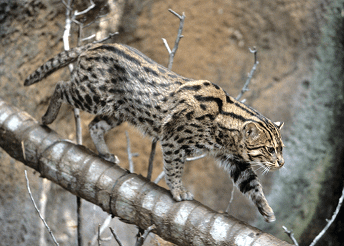 The weight of fishing cat is between 5 to 16 kg. Size between 65 to 86 cm. and the length of tail is between 24 to 35 cm. They are about 30 to 35 cm high at the shoulder. The color of long stocky body is olive grey, with black or brownish spots arranged in horizontal streaks running along the length of the body. The markings are a combination of both spots and stripes. Six to eight dark lines run from above the eyes between the ears over the crown to the nape of the neck. The face is spotted, with short hairs, and elongated with a distinctly flat nose and ears. Color of eyes is yellowish brown, with greenish irises. The fishing cat has a smaller and less developed tooth. Ears are short and round with black backs, and prominent white spots in the middle. The white or light brown underparts of ears have some white or dirty white hairs. The underside fur is longer and often overlaid with spots. Dark strips are present around the throat. They have short tail (around one-third the length of their body). Black incomplete rings are present on the tail. Legs are strong and short, with the forelimbs having two distinct elbow bars. The paws are webbed, and the claws extend past the claw sheaths when retracted. Both sexes are similar in appearance, but males are slightly larger than females. Conservational Status – Schedule – I, according to wildlife (Protection) act, 1972 and classified as Endangered (EN) by the IUCN. They found in India, Nepal, Bangladesh, Sri Lanka, Vietnam, Malaysia, Thailand, Burma, China, Pakistan and the Indonesian islands of Java and Sumatra. 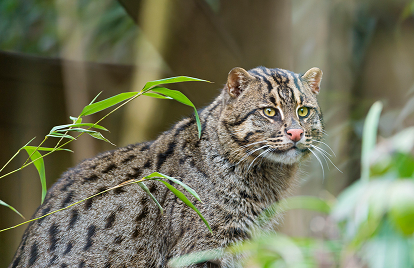 Fishing cats have been reported at elevations up to 1500 meters in the Indian Himalayas. They prefer dense forested regions, and wetland areas. They also found in scrub areas, reed beds, tidal creek areas, vegetated areas near water, marshes, mangroves, rivers, and streams. 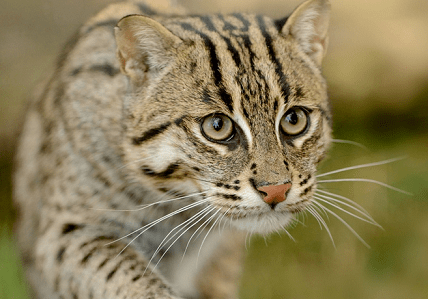 Fishing cats have been reported in Himalayan forests at an elevation of 1500 meters, they have also been found at elevations as high as 2100 meters. Fishing cats are good swimmers, and can swim long distances. They frequently entering the water to prey on fish. Fishing cats are also good runners, they can run 55 kph. 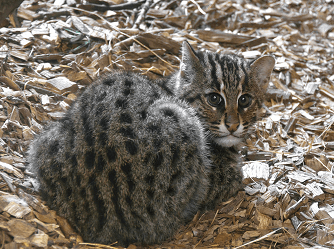 Fishing cat is a nocturnal and solitary animal that rests amongst dense vegetation during the day before heading to the water at night to find food. They mark their territory using cheek-rubbing, head rubbing, chin rubbing, neck rubbing and urine spraying to leave scant marks. Fishing cat make a “chuckling” sound. They feed on fishes, birds, insects, small rodents, molluscs, reptiles, snails and amphibians. Breeding season is between January to April. The age of sexual maturity is between 9 to 18 months. The gestation period is between 63 to 70 days. Females give birth to 2 or 3 kittens. Their eyes are open by 16 days. They are able to actively move around by the age of one month. Meat is taken around about two months of age. The kittens are weaned between four and six months. They reach full adult size at about 8 to 9 months old. Young are fully independent between 12 – 18 months. They can live up to 10 to 15 years old.